Sharing Google maps location often makes it easier and more convenient for consumers to walk to your business location. Beaconstac markdown cards have the ability to search for your business location and embed a Google Maps location. Visitors can scan the QR code and access your business webpage with Google Maps navigation. 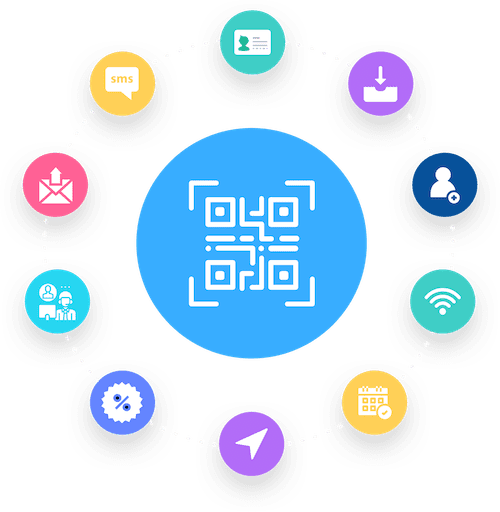 Input all contact details in a single place, on the Beaconstac QR code generator, and generate a vCard QR code. Use this QR card to share your personal details with your clients, at events, or with potential buyers. Most businesses have multiple social media accounts - Facebook, Twitter, Pinterest, Google+, Linkedin and Instagram. Display all your social media channels in one place and let your customers choose where they want to get in touch with you. Delivering PDFs as resources are beneficial for a host of reasons - they have a low overhead cost, the content is flexible and they can be an excellent guide. Help consumers make smarter choices by delivering relevant documentation for the same. These could be case studies, step-wise tutorials, detailed product brochures, magazines and catalogues. These scan codes can be used to promote app download from in-store footfalls, email list, website traffic and other relevant offline and online channels.